Your body is capable of achieving great things with the right guidance. We believe those “great things” include self-healing and self-regulating. Chiropractic care is about making you more functional and productive, enjoying life in a healthy state of mind. How? Well, chiropractic care is an all-natural, gentle, non-invasive way to align your spine and allow your body to heal, self-regulate, and maintain true health. Pretty incredible, isn’t it? 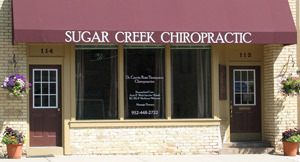 Welcome to Sugar Creek Chiropractic! “We enjoy spreading the message of holistic, chiropractic care to as many people as we can. And that starts right here in our office.” Providing you with a comfortable, satisfying experience is our top priority! We’ll go the extra mile to make sure you’re relaxed and enjoying our peaceful office, friendly staff, and gentle, effective care. Prefer a certain technique to another? We’ll change it. Need a different appointment schedule? No Problem. We’re Here. And We Can’t Wait to Help You! Live the incredible life of your dreams! Think we can help but still have questions? No problem, we’d love to speak with you and see how we can help. Call today and let’s get started!